After having received the Renata Tebaldi award from NIAF a couple of years back I was approached by several wonderful people who just loved the evening and the feel of the concert which showcased Roberto Iarussi. They want to recreate it all over again in Woolsey Hall with Roberto and I in a gala recital on that fabulous stage to benefit the America Cancer Society and to film the event for PBS. Naturally this is great fun and it is just before the Holidays get off and running, so it might make for a lovely evening of music. Woolsey is a magnificent piece of theatrical eye candy and very grand. 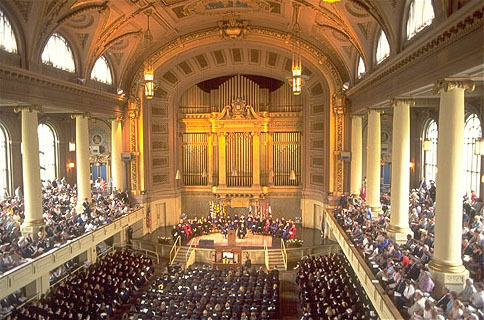 It sits nestled on the grounds of Yale University and has a cathedral like acoustic. I am thrilled and it is an old fashioned night of opera and song. Just being announced shortly, details to follow. Wait till you see this place. December 6th at 8:00. ~ by aprilemillo on October 9, 2008.